Our range of products include speed control resistor/starting resisitor/rotor resistor panel. We are offering Speed Control Resistor to our clients. For starting/Speed Control of AC or DC Motors, resistors are manufactured as per customers requirement at specified starting torque or for limiting initial inrush current to an acceptable value. Mainly these are used for cranes. The rating can be 2 minutes, 5 minutes, 10 minutes, continuous or intermittent. 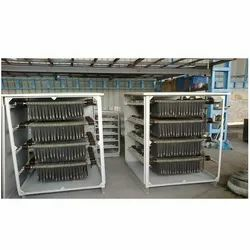 The material of resistor is normally Stainless steel AISI-304, AISI -410 or AISI 430 or FeCrAl-AISI-406. Type Tests: Temperature rise test i.e., Heat run test, if required, will be conducted by passing equivalent/rated current for rated/equivalent time keeping IT Constant through a part of Resistor. Looking for “Speed Control Resistor”?